A therapy dog named BobDog listens to students practice their reading at Paradise Elementary every week. 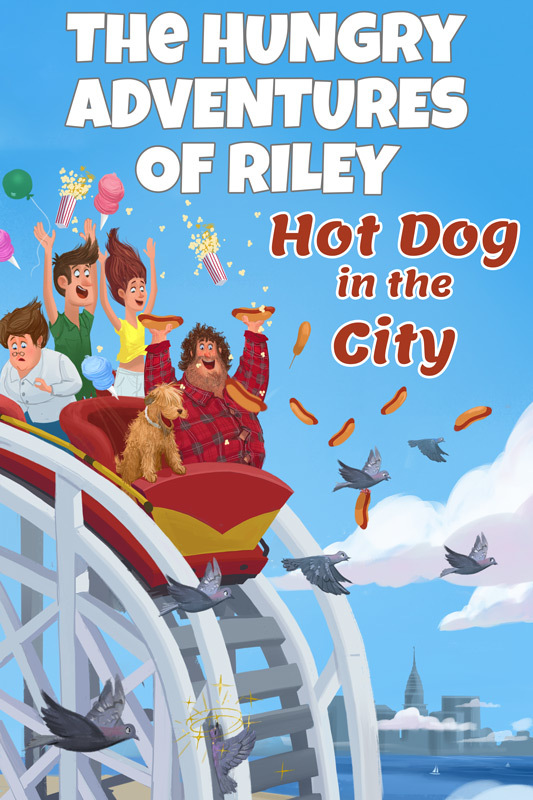 Author Arielle Davies collaborated with the school for their latest read, the author's new Read Aloud illustrated eBook series The Hungry Adventures of Riley: Hot Dog in the City starring BobDog’s very own sister, Riley. Read Aloud eBooks like The Hungry Adventures of Riley and other eLearning apps and games, are crucial tools in Johnston’s classroom. 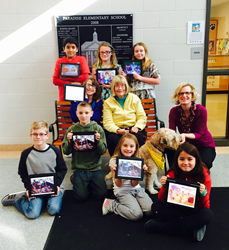 BobDog, a certified therapy dog, listens to Marie Johnston’s students at Paradise Elementary read every week. Last week, BobDog received a special treat. The lovable seven-year-old Soft Coated Wheaten Terrier was read a new Read Aloud illustrated eBook series starring his real life sister, Riley, in The Hungry Adventures of Riley: Hot Dog in the City written by Arielle Davies and illustrated by Jason Norton. The Hungry Adventures of Riley is based on the wily antics of author Davies’ Wheaten Terrier and their Brooklyn based family’s travels. In the first eBook of this debut series, Riley adventures through Brooklyn’s Coney Island, where only hot dogs can satisfy her insatiable appetite. Read Aloud eBooks like The Hungry Adventures of Riley and other eLearning apps and games, are crucial tools in Johnston’s classroom. Johnston can achieve educational goals like individualized learning and increased student engagement easier than before. Read Aloud eBooks feature a narration tool that can be switched on or off, allowing the reader to see words highlighted as the story is read. The Hungry Adventures of Riley has been rated “five stars,” by the school children. Students can relate to protagonist Riley, knowing their trusty reading partner, BobDog, is her brother. Banner Sweet Talkin' Guy, colloquially known as BobDog, is an AKC (American Kennel Club) champion whose merits of therapy, canine good citizen, and rally certification make him more than deserving of his charming name. BobDog has tallied more than one hundred visits and listened to over seventy-five children eagerly read to him and his owner Carol Carlson over the last three years at Paradise Elementary. BobDog’s companionship brings enthusiasm and motivation to the classroom, all ingredients for a successful reading program. The Hungry Adventures of Riley is not only receiving praise in Johnston’s classroom, but also garnering rave reviews from consumers and industry leaders. “Hot dog! Arielle Davies has written one tail-wagger of a book! I dig it!” says Andy Robin, award-winning writer, director, and producer known for the children’s film Bee Movie and hit TV show Seinfeld. Davies released The Hungry Adventures of Riley in November of 2014. With vibrant illustrations by Jason Norton and lively Read Aloud narration by Davies, the book gives readers a real sense of Riley’s colorful personality. Targeted to children ages five through ten, both young readers and adults will enjoy the first adventure of this debut series. The Hungry Adventures of Riley: Hot Dog in the City is available to download on Apple iBooks, Amazon Kindle, and Google Play for $2.99. Arielle Davies is a children’s author utilizing her experience in media, publishing, linguistics, and education to create vivid digital experiences for young readers. Arielle has worked at The New York Times, The Wall Street Journal, Time Out New York, and AT&T. She lives in Brooklyn with her husband, baby boy, and of course, seven-year-old Soft Coated Wheaten Terrier, Riley. *Read Aloud currently only available on iBooks.